One of the many features introduced in BeerSmith 2.3 is improved handling for whirlpool/hop stand handling as well as support for the “no chill” brewing method. These features give home brewers more flexibility than ever for handling whirlpool hops and extended chill periods for your wort. Today we’re going to look at some of the new features available. As little as ten years ago, hop stands and whirlpool hops were largely ignored in home brewing and even by most professional brewers. Only boiling hops were thought to add significant bitterness to the beer. Instead of hops at flame out, short “flavor” additions were wildly popular with people adding hops at 5, 10, 15, 20 or 30 minutes before the end of the boil to increase the flavor and aroma of the beer. Only recently have we come to understand that short boil “flavor” additions are largely a myth. While these flavor additions certainly do add additional bitterness as alpha acids are isomerized by boiling, they arguably do so inefficiently since longer boil periods yield higher utilization (more IBUs) using less hops. Even worse, these flavor additions boil off most of the critical aroma oils rather quickly. Myrcene is cut in half in less than 10 minutes in the boil. Same for linalool. Others such as geraniol, caryophellene, and humulene last a bit longer but are still cut in half in less than 15 minutes of boiling. Boiling your hops is simply not an efficient way to preserve desirable hop oils. To preserve the aroma oils in your hops you need to dry hop or add them after flameout. 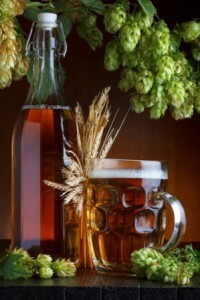 So over the last 10 years, hop stands or whirlpool hops (adding hops after flameout while the wort is hot) has become a popular technique (along with traditional dry hopping). It turns out that these hops still add some bitterness as well, though the utilization is much lower than boiling. Recently brewers looking to save time have moved to a method called “no chill” brewing. In this method, the beer is mashed and boiled normally, but instead of chilling and immediately fermenting the beer, the beer is instead added boiling hot to a sterile plastic cube or other container and left overnight to cool naturally before the yeast is pitched (or transferred to a fermenter and then pitched) for fermentation. In some ways this is equivalent to a long hop stand, as some bitterness is created while the wort is still hot in the cube. To compensate many brewers use a rule of thumb adjustment such as “add 10%” to the IBU number to compensate. However this is not a precise number as various hop additions may have different portions of remaining not yet isomerized alpha acids. The early versions of BeerSmith did not attempt to calculate whirlpool hop utilization (bitterness) and assumed it was zero. In version 2.2 a whirlpool utilization option was added which uses a roughly 50% utilization factor (50% of equivalent boil utilization – which you can set under Options->Bitterness) based on a whirlpool or hop stand temperature of 90 C. You can use this option simply by adding a hop ingredient to your recipe and setting the “Use” for the hop to “Steep/Whirlpool”. It turns out that hop utilization does drop off pretty quickly below the boiling point – so this is not a bad approximation for whirlpool above roughly 85 C. However BeerSmith 2.3 only applied this utilization to hops specifically marked as steep or whirlpool hops, so it did not carry over hops that may be left from the boil. This made the feature not suitable for no-chill. BeerSmith 2.3 expanded whirlpool hop handling in an important way. First, you now have the option to carry forward unused hop bitterness from boil hops into the whirlpool. This was done as an option (under your Equipment profile -> Whirlpool/Steep Utilization there is a new checkbox called “Estimate Boil Hop Util in the Whirlpool“). If you check this box, each boil hop addition will be evaluated based on the remaining hop alpha acids not already isomerized, to estimate the bitterness contribution in the whirlpool. An additional “Whirlpool time” field was also included to let you adjust the total time the whirlpool is hot. A cutoff temp of 85 C was picked as hop utilization drops pretty rapidly below that temperature. The net effect is you can now get a full picture of both boil and whirlpool hop additions and their individual contributions to the overall IBU value, as each is individually integrated for an accurate estimate. Using this same feature you can now get an accurate estimate for “no chill” brewing. You mark the box to estimate boil hop utility in the whirlpool to carry forward remaining bitterness. All you need to know is the approximate time the cube or hot wort vessel you are using is above 85C, and the program will carry forward the boil hops and estimate the additional IBU additions that happen as the cube is chilling. This also has the advantage of giving a much more accurate number than the old “rule of thumb” blanked hop percentage as it calculates each addition based on its boil time and remaining non-isomerized alpha acids. So that is a summary of some of the new whirlpool and no chill features in BeerSmith 2.3 and higher. Thanks for joining me on the BeerSmith Home Brewing Blog. Be sure to sign up for my newsletter or my podcast (also on itunes…and youtube…and streaming radio station) for more great tips on homebrewing. Also check out the How to Brew Video series I shot with John Palmer if you want to learn more about all grain brewing. 2.3 has been a great update, but i have a suggestion regarding this feature for future updates. Why not allow the user to input their own “whirlpool temp” and have the utilization calculated based off that and the time value the user has already inputted? If a user usually whirlpools with a temp lower than 175, vs adding them at flameout, your calculations in the program seem WAY off. This is something i do a lot on my brews and the ibu predicted in beersmith is always WAY higher than it should be IMO. I tried using the option in equipment profiles under “whirlpool / steep hop utilization” to adjust “whirlpool time above 85” but the amount it changed the recipe is very minuscule. I was under the impression that this function would also calculate the whirlpool addition isomerisation but that does not appear to be the case? If I whirlpool for 30 mins but only 5 of that are over 85 deg C the IBU taken from that whirlpool should be low, but in my case they are unchanged since before I went into this function and changed the minutes? If I am going to steep/whirlpool for 10 minutes, do I need to input 10 minutes in “whirlpool time above 85 deg C”, or would checking the box “Estimate boil hop utilization” in the equipment profile suffice? Say in my next recipe, I wanted to do a 20 minute hop stand, would I have to change this time in my equipment profile to 20 minutes? Unless I’m missing something, it would be nice to be able to set a time and temperature for the hop stand/whirlpool hops. e.g. 30 mins at 90c within the hop addition. See how that calculates IBUs. It would help me refine a receipt further, at the moment 95% of all hoppings I do are whirlpool and dry hop. Not much gets boiled these days. I second (third? fourth?) the ability to establish whirlpool temperature. I usually add my whirlpool hops below 170F and sometimes as low as 120F based on research/experiments. I don’t like how BS adds IBUs to my count when I know I am not adding any bitterness to my beer, especially at the lower temps. I think an interim solution could be to just put a check box asking if the user wants the IBUs to be counted towards the total IBU count. If you set the time to zero minutes for the hop it will not count any IBUs. If I use a hop bag in the keggle and remove the bag when the cube is full, will isomerization still continue in the cube? Or does isomerization only apply to hop crud that carries over to the cube in other words no crud into the cube means no extra bitterness.